Having heard the sickening news of the fish kill in Menindee I drove there as soon as I could. Because of the current drought, high temperatures and long term bad, if not corrupt management, the lower Darling River was infected by blue/green algae (a pernicious growth that poisons warm, tepid water). Then a drop in temperature killed the toxic algae bloom. When it dies it decomposes and siphons oxygen from the water, suffocating the fish. It’s estimated a million fish died. Thinking about it during the long drive from Sydney, having recently re-read Bruce Pascoe’s Dark Emu, I contemplated ways of embedding myself/us, white Australians, into the catastrophe. Maybe push my pale feet amongst the fish carcasses, into the mud and algae-infected water? My hands? Millais’ painting of drowning Ophelia popped into my head but how to photograph myself with no assistant or tripod? Fortunately I met photographer, Melissa Williams-Brown in Menindee who loved the idea immediately, and we worked together to stage and shoot the performance for camera, Menindee Fish Kill. Synchronicity was the order of the day. Ophelia’s pose and facial expression were a perfect quotation – chest heaving, she sinks into the water, her hands raised in helpless supplication. Her eyes gaze into the middle distance, her face in shock. I’m immersed in gross toxic water, dead fish, maggots, a fly on my face. My garment’s paisley pattern – fish shapes/tear drops, but also signals colonial appropriation – the pattern originated in the Middle East and India. The Scottish town, Paisley, copied the pattern, claimed and named it. This appallingly abject image powerfully evokes a complexity of feelings, a sharp reality, haptic, empathic. Melissa Williams-Brown (b 1970) is an Australian photographic artist and professional photographer specialising in portraiture, documentary and fine art photography. 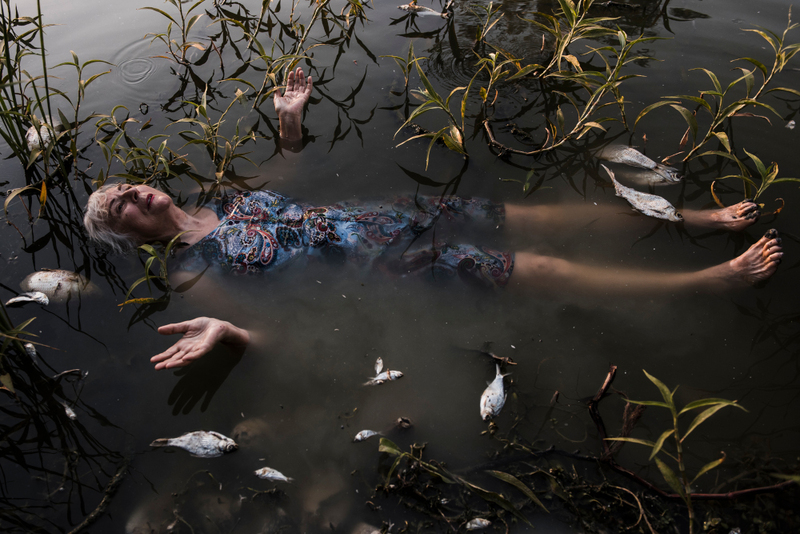 She has been a finalist in several prestigious Australian photographic art prizes. Two non-commercial Sydney galleries ended 2015 with group exhibitions of political art. 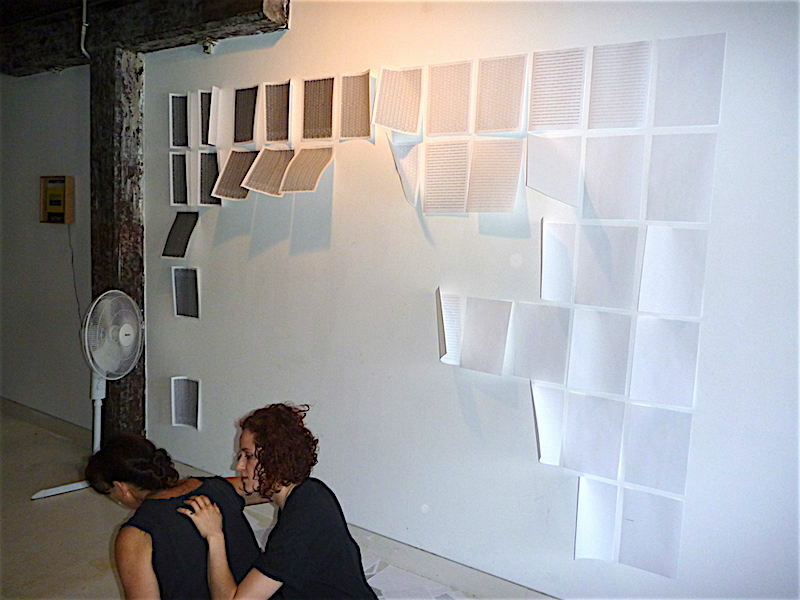 Verge Gallery, funded by the University of Sydney Student Union, showed Refuge while Articulate Project Space, an artist run initiative, exhibited Have Your Say. In spite of these outward similarities both galleries were poles apart aesthetically and perhaps even politically. Have Your Say was a boisterous, stylistically-inclusive affair that demonstrates how liberating conceptual art can be when it lets its hair down. Articulate Gallery had been prompted by “the social and political crises facing the world to invite artists to have their say…”(Have Your Say Facebook page). Displaying a no holds barred approach, artists dealt with political subject matter that rarely gets funded by government or big business. Have Your Say wasn’t afraid to tackle the impacts of mining, gender violence, rampant capitalism and economic inequality head on. Many artists in the show were moved by climate change and the spectre of mass species extinction to visualize explicit data on the Anthropocene. 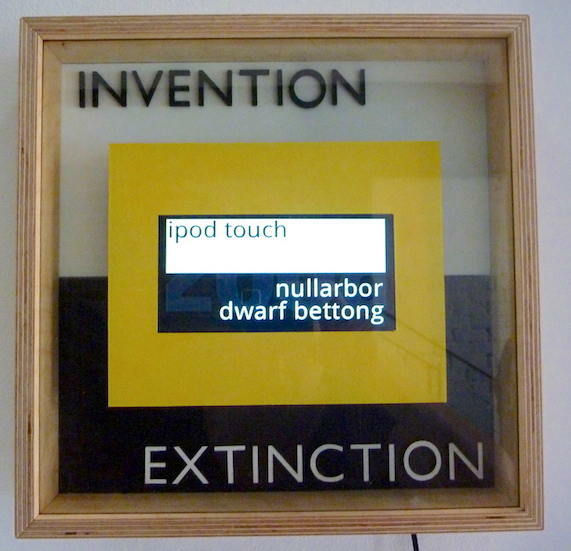 Gary Warner’s work ‘Exhortations/Invextions’ used an altered photoframe to match annual technological inventions against annual extinctions. The viewer is forced to confront the year by year cost of so called progress on the macro level. Marta Ferracin’s whimsical installation Meeting Point used multi-channel video and wind-up carillons. Part New Materialism and part Surrealism it explored sensory connections between nature and the mechanical in a confounding way. Bylong, a penumbral, layered mesh floor piece by Margaret Roberts, spelled out the unfolding tragedy of so many regions being destroyed by open-cut mining. Her online artist statement doesn’t try to aestheticise this ugly reality but on the contrary includes Lock The Gate’s web site which states: “The residents of the Bylong Valley, like communities all around NSW, want action to protect land and water resources from coal mining. The government’s failure to deliver this is nothing short of criminal.” Certainly no fig leaf there. RAW Contemporary performers with Betablocked installation at Articulate Gallery. Photograph Bernadette Smith. Performance art had a strong presence in the show with several affective performances stressing human intimacy and connection perhaps as a corrective to virtual reality. Regardless of overarching claims that globalisation and digital culture have brought us closer together with the world now at our fingertips most performances invoked a need for physicality. Artists responded almost shamanically to a sense of social alienation born of late capitalism. Performers included RAW Contemporary artists led by Renay Pepita and Linda Luke seen above foregrounded against no words anymore installation by Betablocked. Linden Braye’s installation with Barbara Halnan’s Greed artwork in foreground at Articulate Gallery. Photograph Bernadette Smith. It was a pleasant surprise to rediscover one of my altered trolleys in Lyndon Braye’s created and found object Arte Povera installation at Have Your Say. All elements worked together to produce something greater than the sum of its parts. While the purists might disagree I believe this creative serendipity and collective authorship helps subvert the art market imperative of a sole creative genius. 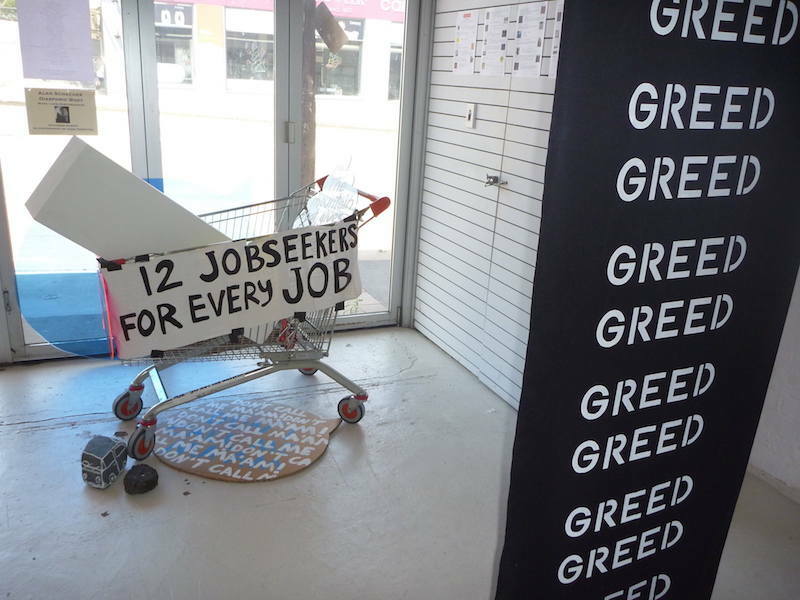 The aesthetic language and social context was further deepened by being exhibited in close proximity to Barbara Halnan’s Greed artwork seen above in situ at Have Your Say. It is simply not possible to review all the memorable works in this show but for me taken as an organic whole, it was a powerfully, visceral experience. Refuge at Verge Gallery, curated by Siân McIntyre, aimed to: “broaden the dialogue around current Australian policy with works by refugee artists, non refugee artists and collaborative works…”. In contrast to the cornucopia of unrestrained creative expression at Have Your Say, Refuge had a somewhat austere, institutional atmosphere not unlike the waiting room of an Australian Immigration department perhaps. “If You Come to Australia” installation consisting of flags, headphones, carpet and digital photo frames by Katie Green and collaborators at Verge Gallery. Photograph Bernadette Smith. Near the entrance was a prominently sited installation seen above called ‘If You Come To Australia’ by Katie Green and collaborators. 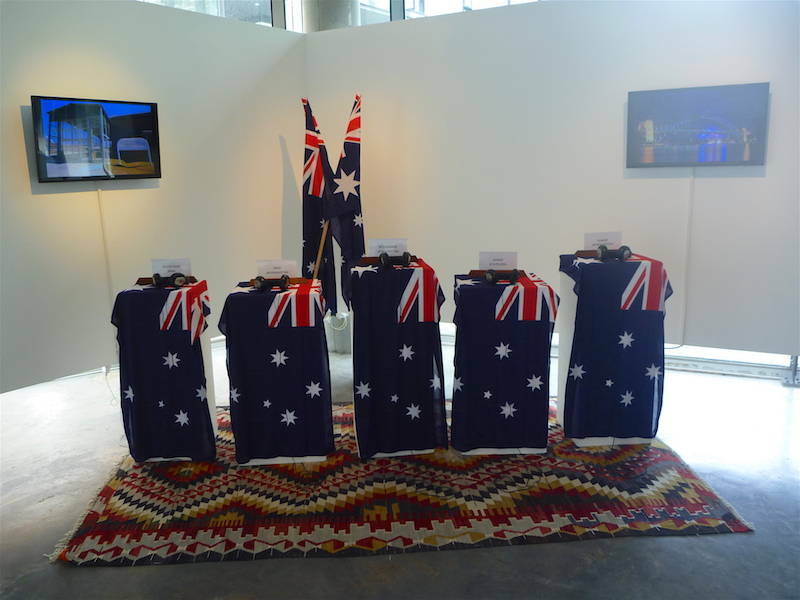 This consisted of plinths covered with Australian flags and headphones which played back harrowing refugee accounts of seeking asylum and their hopes for a successful future in Australia. The symbolism was accentuated by the gallery visitor having to stand on a handcrafted Turkish carpet in order to listen. This served as a metaphor for the way Australians have sometimes been complicit in trampling over ethnicity and human rights. 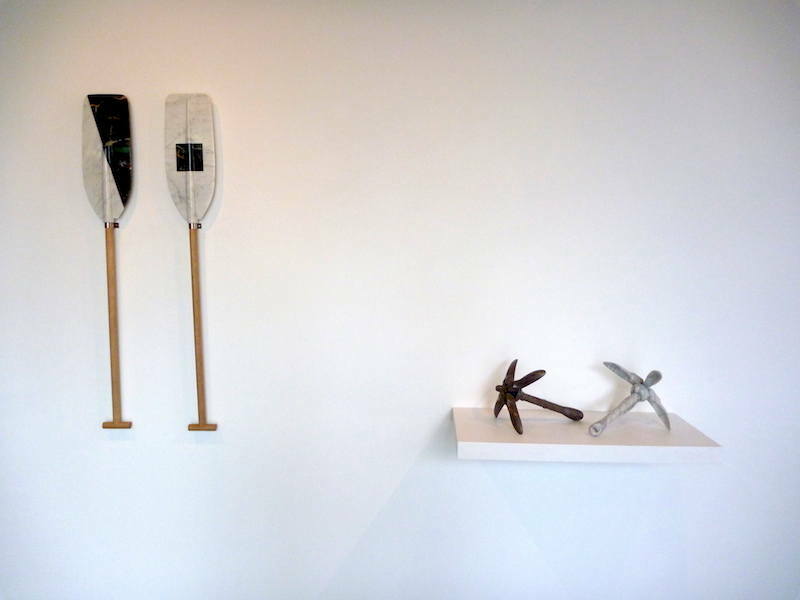 Juxtaposing precious luxury objects as markers of suffering and displacement was Alex Seton’s life size marble and bronze sculpture of an anchor and paddle inlaid with signaling flags. The flags spell out Stop Your Vessel evocative of desperate attempts by refugees to reach Australian waters. In the catalogue statement Siân McIntyre urges us to remember those less fortunate while in “this sterile gallery environment”. This is a curious statement – why would the curator and gallerist condemn such a space in these terms. The traditional white cube that Verge is creates a neutral space which ought to allow oxygen for the conversation around the work exhibited. The curator appears to be confusing ‘sterile’ with ‘neutral’ in her essay and one is left wondering why? “Stop Your Vessel” marble and bronze sculptures by Alex Seton at Verge Gallery. Photograph Bernadette Smith. 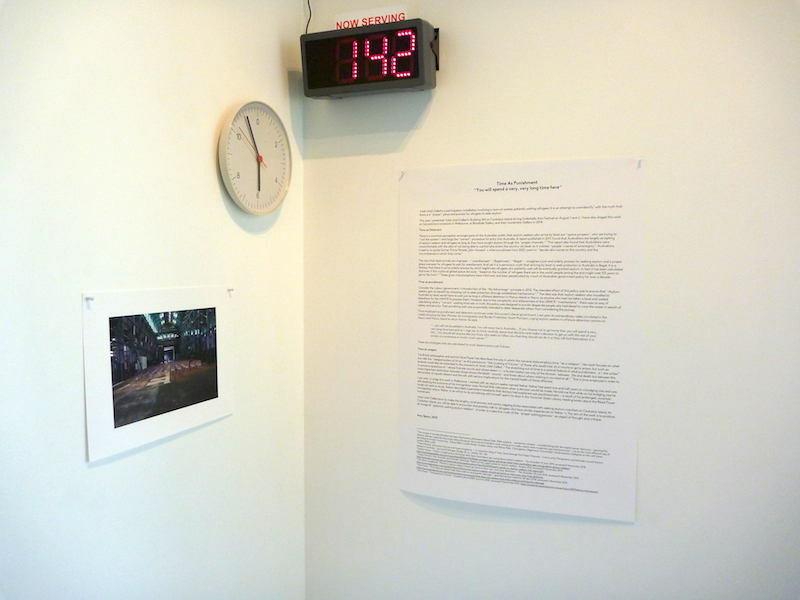 Adjacent to Seton’s carvings were props such as clocks, timers and documentation seen below from Amy Spiers performance installation staged earlier in 2015 at Underbelly Arts Festival. ‘Wait Until Called’ had involved simulating a room of patiently waiting refugees who were being punished by having to wait “a very long time” to be processed for asylum status because they had attempted to come to Australia by boat. The Verge wall statement quoted Nina Power who theorises that carceral states use time as a weapon to crush the sanity and futures of those held in legal limbo. Power is quite accurate in her description but it could just as easily apply to jobseekers or homeless people already in Australia. A third of Australian residents could identify with the endless wasted time waiting as denizens in welfare offices and job placement agencies while getting nowhere. It begs the question why art about economic inequality across the board is never aired in publicly funded galleries. Arguably they should allow local artists to record the desperate stories of jobseekers and the homeless right here in Sydney without the need to look any further afield. Instead art funding bodies, decision makers and even activists turn a blind eye to the needless suffering caused by neo-liberalism. Could it be that our society is becoming desensitised to the poverty in our midst and conditioned by the constant demonization of poor people in Australia? “Wait Until Called” Verge Gallery display of documentation and props by Amy Spiers from an earlier performance/installation at Underbelly Arts Festival. Photograph Bernadette Smith. I asked curator Siân McIntyre about the relationship between refugees and the existing underclass who can be seen as ‘refugees’ from the kind of society which is the logical outcome of austerity and Neoliberalism. McIntyre replied that raising these issues too prominently in the context of the exhibition posed the danger of being perceived as aligning oneself with racist groups such as Reclaim Australia. I responded that it could hardly be racist to prioritise jobs and housing for poor people already here since it would help Indigenous Australians and minorities who are over-represented among Australia’s underclass. (I might add that this underclass status largely stems from the historic oppression of colonised people rather than being the result of so called “character flaws” that the oligarchs would have us believe.) She still said it sounded like something you’d see on the website of Reclaim Australia so today I looked up their website but could see nothing of the kind there. What I did see though was an over-predominance of Australian flags which reminded me a lot of the Refuge exhibition. In fact the clinical absences and didactic nature of the show brought to mind the middle class value judgements made in Victorian era England about deserving and undeserving poor. Ultimately if we go down that path it is going to lead to more inequality and a truly emancipatory politics needs to treat all disadvantaged people equally. Hopefully we may one day see a Refuge exhibition about Australia’s unacknowledged refugees like the over 28,000 homeless people in New South Wales some of whom can be seen below in Belmore Park. As usual it is the poor who are asked to carry the burden as our fractured society attempts to deal equitably with refugee intakes. 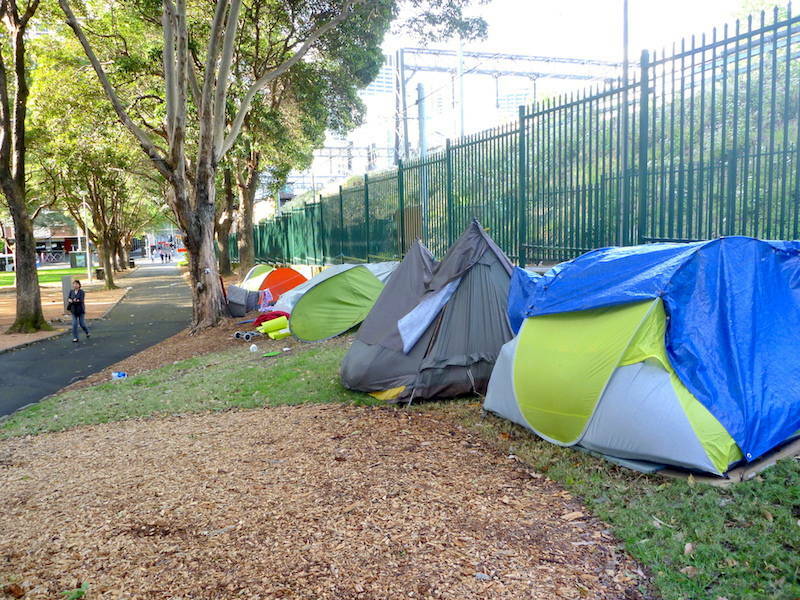 Some of Australia’s homeless internal refugees at Belmore Park in Sydney. Photograph Bernadette Smith.